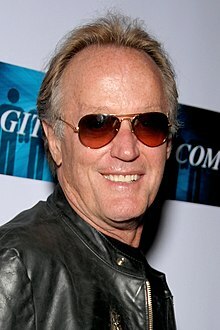 Peter Henry Fonda (born Februar 23, 1940) is an American actor. He is the son o Henry Fonda, brither o Jane Fonda, an faither o Bridget an Justin Fonda (bi first wife Susan Brewer, stepdauchter o Noah Dietrich). Fonda is an icon o the coontercultur o the 1960s. This page wis last eeditit on 13 Julie 2016, at 21:08.